Twitter just revealed that it made a monumental security blunder by exposing the passwords of users in plain text. The company says there’s been no indication of a security breach tied to the log that contained those login credentials, but let’s not kid ourselves. It’s 2018. You need to change your password — on Twitter and with any other account where you might’ve repeated that password — and secure your Twitter account immediately. The full scope of what happened here isn’t yet clear (or how many users were directly affected), but there’s no downside to taking immediate action. On the web: Go to Twitter.com, click your profile image in the upper right, choose Settings and privacy and then when the next page loads, select Password in the list running down the left side. Twitter will ask for your existing password and then your new one. Use a strong, unique password. And never repeat them between multiple services, apps, and online accounts. From the mobile app: Tap your profile photo at the upper left and choose Settings and privacy. Then Account, followed by Change password. Again, ensure that your new password is used exclusively for your Twitter account. A password alone isn’t enough of a wall between you and people with tech smarts and bad intentions. 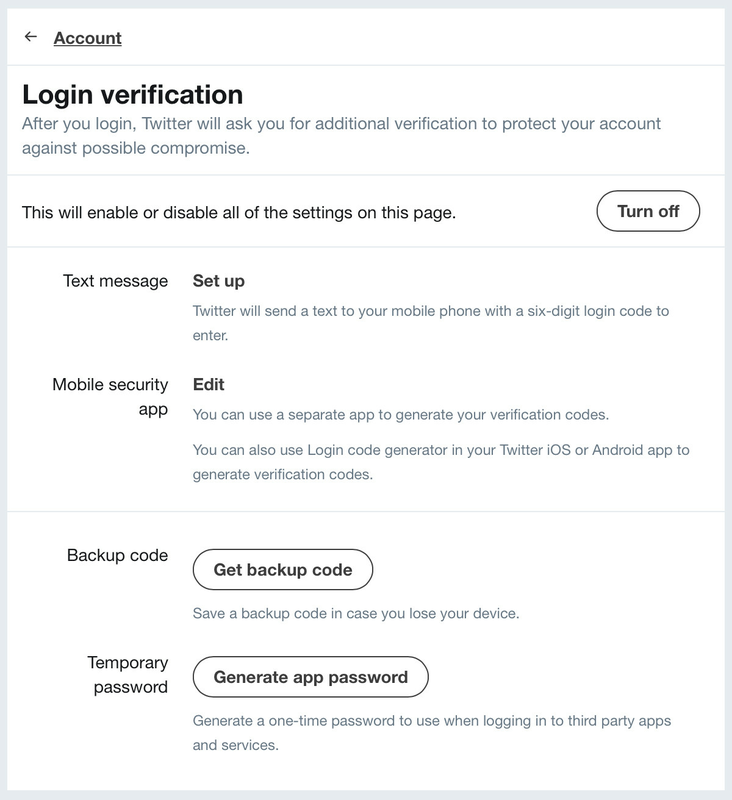 Aside from changing your Twitter password, locking down your account to the fullest extent possible requires enabling the company’s login verification feature. This two-factor authentication process can either send a code to your mobile phone number whenever a new device attempts signing into your account with the correct password. Or you can generate your own code within a third-party app made for that specific purpose — like Authy. The latter approach is safer since SMS itself can be compromised. Choose Account and then Set up login verification. On mobile, there’s an extra step here where you’ll have to tap on the Securitysection inside Settings and privacy. Click Send code to add your phone number if that’s the verification method you want. Enter the verification code sent to your phone, hit Submit, and login verification will then be enabled. Click or tap your profile icon, then click Settings and privacy. Look for Mobile security app and you should see a Set up next to it. Read the instructions and then hit Start. Verify your password if asked to. You’ll then be shown a QR code that you’ll scan with the app that will generate your Twitter login code. Once that’s done, you should see the app automatically generate a six-digit code. The code changes every 30 seconds. Enter the currently active code in the Security code text field and click Done. WHICH APPS SHOULD I USE TO GENERATE LOGIN CODES?